to all those who attend. 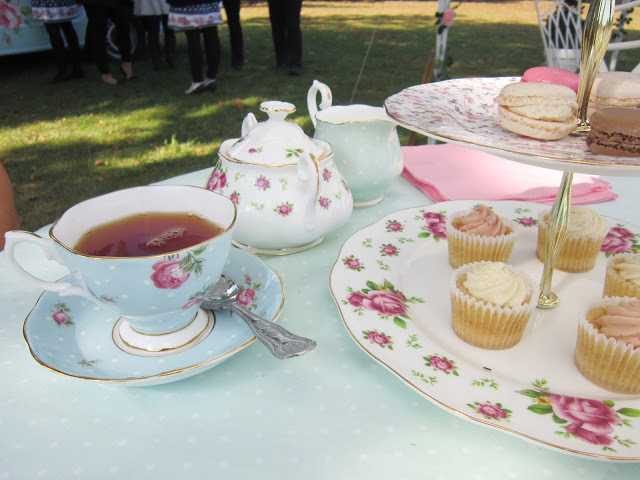 This is a totally free event, and Mum and I weren’t sure what to expect, but as we both love afternoon tea and Royal Albert china we thought that we should pop along as it was such a glorious day! 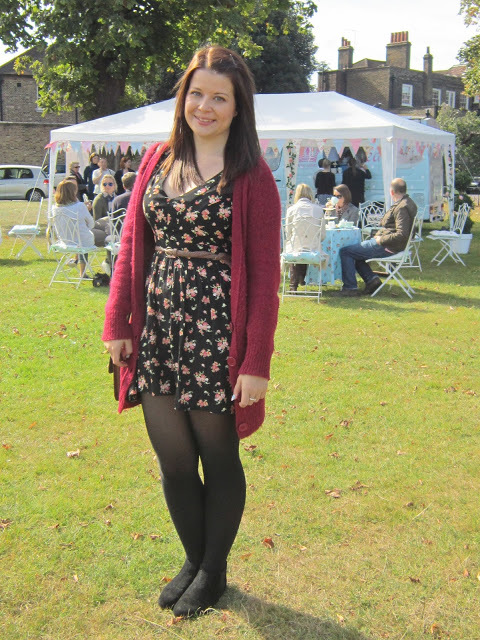 The sun was shining, and we got the tube to Kew Gardens, then took the short walk down to the green. Kew is a gorgeous part of London, the houses were stunning! 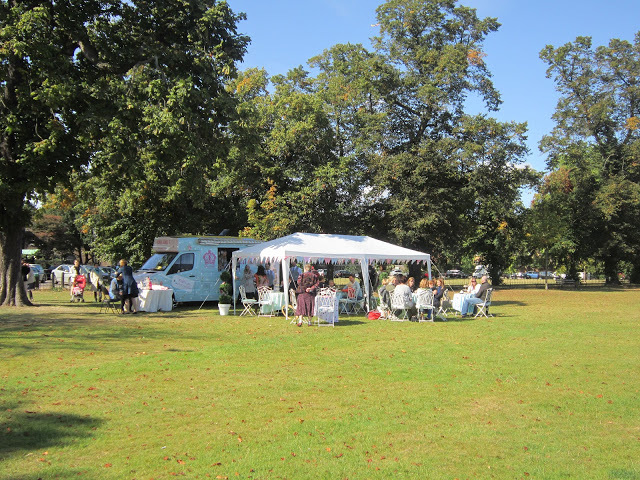 We saw the gorgeous van as we we’re walking up to the Green, it was decorated in a gorgeous blue with a pretty pink floral print and polka dots. 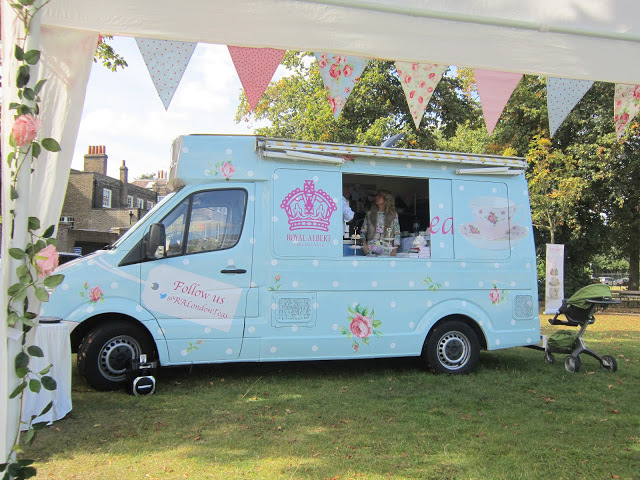 The prettiest van in the world I would expect! 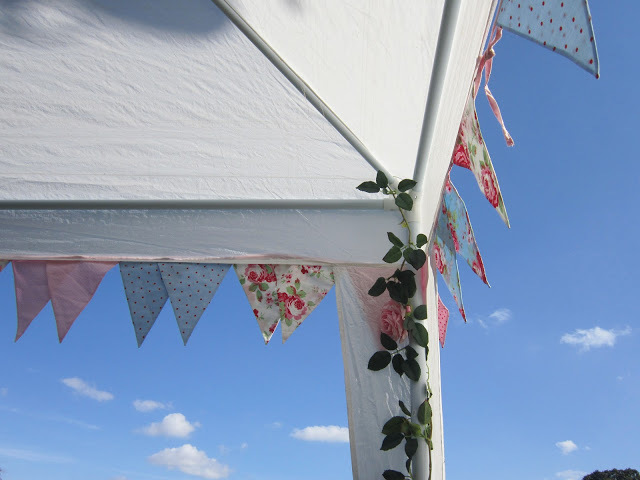 They had set out a gazebo, lined with gorgeous floral bunting and rose garlands, and put out pretty white garden tables and chairs. 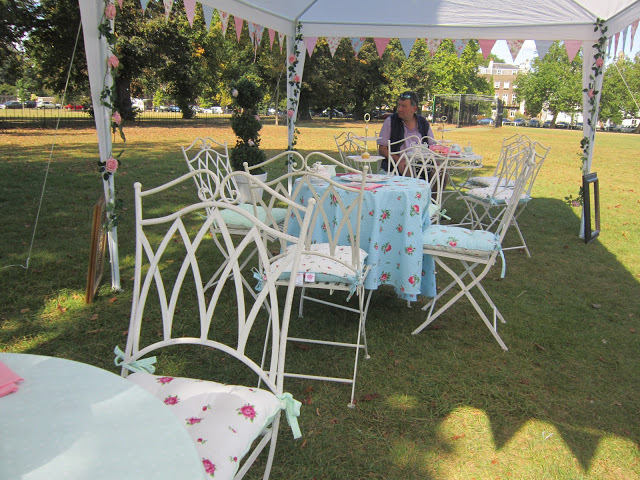 The chairs had on some of the Royal Albert seat pads which were so pretty! 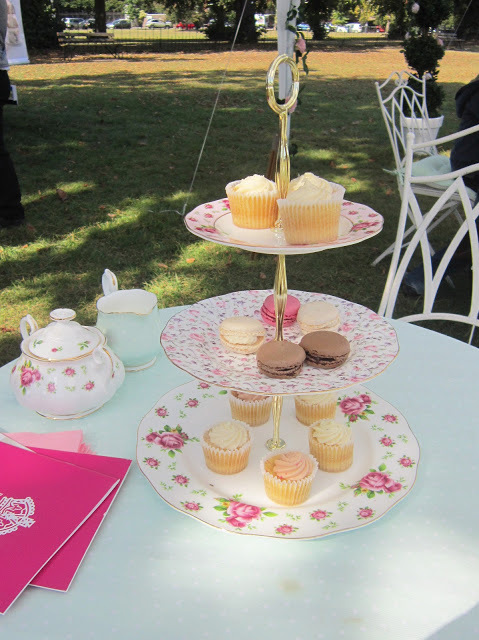 We were offered a seat at a table, and then we were brought a 3 tier cake stand filled with tiny cupcakes and macaroons. The table was set out with stunning china pieces, all slightly mismatched which gave such a lovely effect. We were then offered a drink, Mum had a cup of tea, and I got an orange juice.. in a tea cup! I love tea cups, but I rarely drink out of them as I hate tea. However I think I might have to start pouring my Cola into a tea cup at meal times! The hosting ladies were dressed in pretty matching dresses, and the men were very smartly dressed in suits. 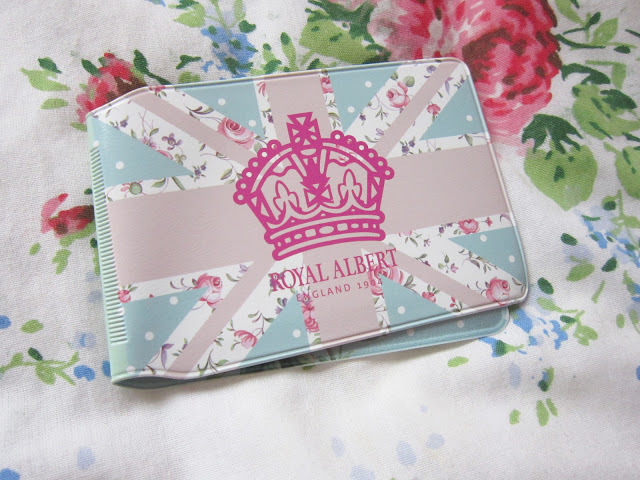 We were also given a free pretty travel card case, and some leaflets. 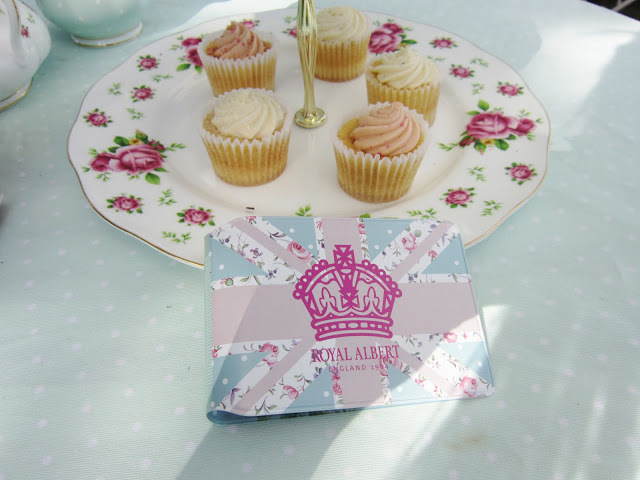 We had such a nice time sitting in the sunshine eating our treats from gorgeous china. They were also offering vintage style hairstyling too! I was a little bit sad we had to leave, but we couldn’t hog the table all afternoon. Royal Albert are relaunching this year, and they are promoting their new wonderful range of china, including New Country Roses. Established in 1896, Royal Albert is inspired by everything English- the country garden and England’s national flower, the rose. 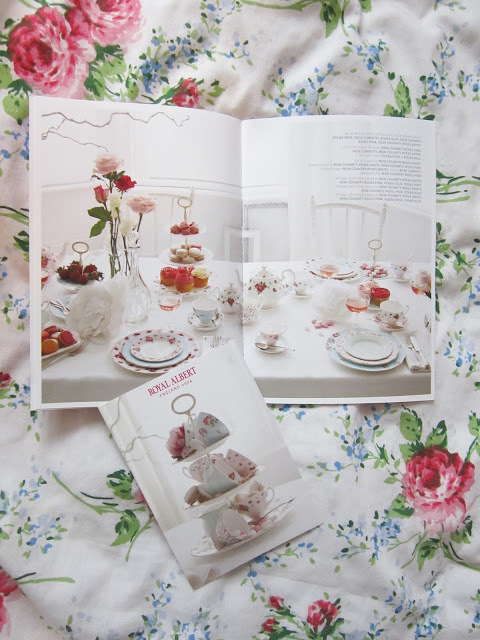 One of the most famous Royal Albert patterns is Old Country Roses which launched in 1962, and has sold more than 150 million pieces since its introduction. This has now been relaunched as New Country Roses, which is a more youthful and contemporary design, which has a beautiful vintage charm. Ooh I went to this on Friday in Soho, it was lovely wasn't it? unfortunately I'd sneaked out from work, and was just wearing jeans, wish I'd had a pretty dress and my camera with me!! That looks like is was a lot of fun!!! Hi, your blog is gorgeous! 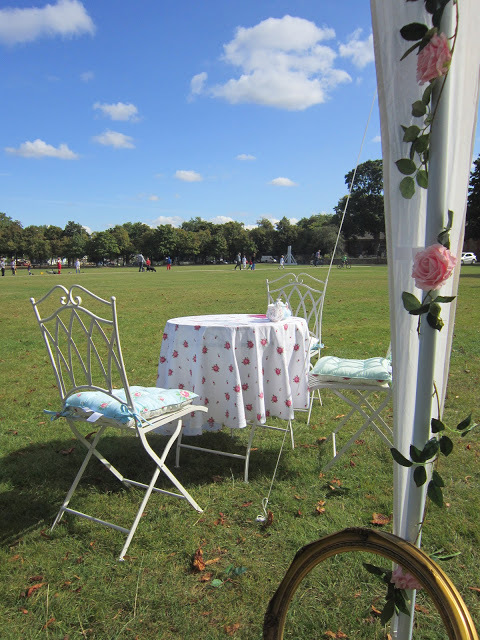 Do you have contact details for the Royal Albert people by any chance, or know whether they do private events as well as the public pop ups? 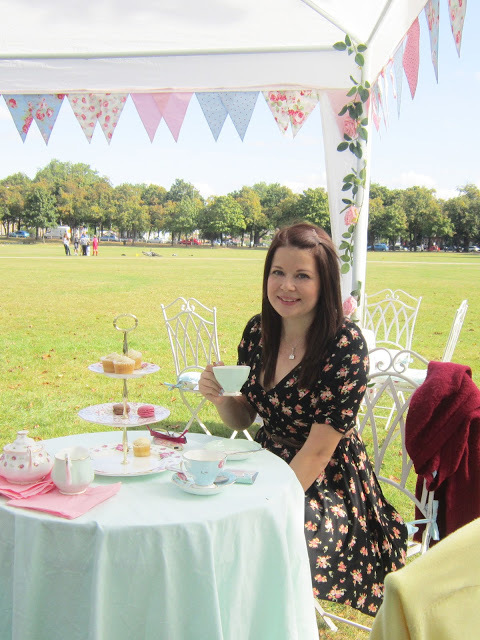 Thinking of having my evening wedding reception at Kew Steam Museum, but it's only open in the evenings so thought about a vintage tea party for the afternoon ceremony and 'wedding breakfast' (we're doing a humanist ceremony, so don't need somewhere licenced, as doing paperwork elsewhere) and when I googled 'vintage tea party Kew', this came up and looks so lovely! 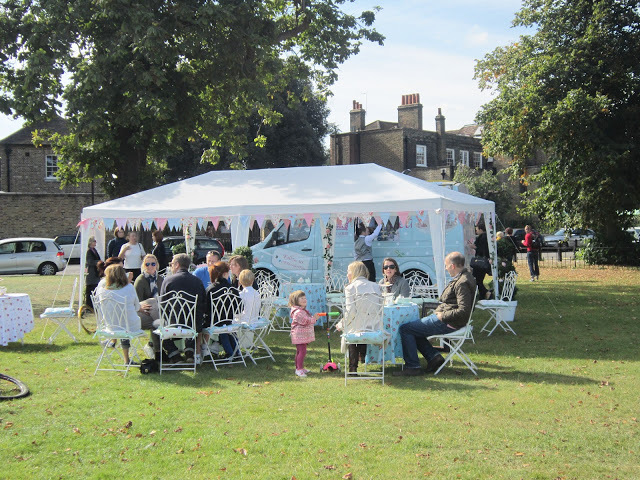 Or do you happen to know of another company who might do something like that, on Kew Green? 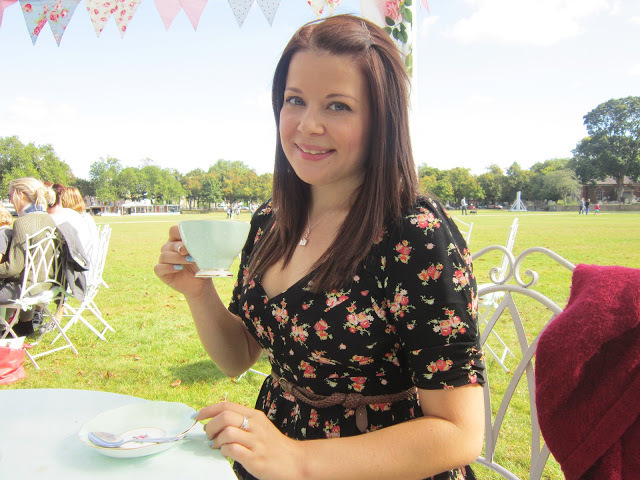 Seems like you are a bit of an expert on vintage tea parties!